The property has one double bedroom, a comfortable open plan kitchen and living room with small dining area. The kitchen is fully equipped with large fridge/freezer, double oven and hob and washing machine/tumble dryer. There are plenty of pots, pans and cooking utensils, plus baking equipment should the mood take! There is a large sofa and wood burning stove. The bathroom has a shower and heated towel rail (no bath). There is a TV for the purpose of watching dvds only as there is no reception. There is no WiFi, but you can get a good phone reception. Weeks run from Saturday to Saturday in the summer (beginning April until end October). Shorter breaks are available during the winter months. Hello, my name is Ellen Campbell and I am the owner of Ellen's Bothy. I have had the property since 2007 and it has been running as a holiday cottage since 2009. I have lived and worked on Skye for several years, but I am now based just outside Inverness. I come up to the cottage regularly to take some time out and enjoy the spectacular surroundings and the peace and quiet or I'm up to do some maintenance and see to the changeovers. I also have a lovely local lady who helps me look after the place. I love living in the Highlands and can't think of anywhere else I'd rather be! I fell in love with Skye many years ago. 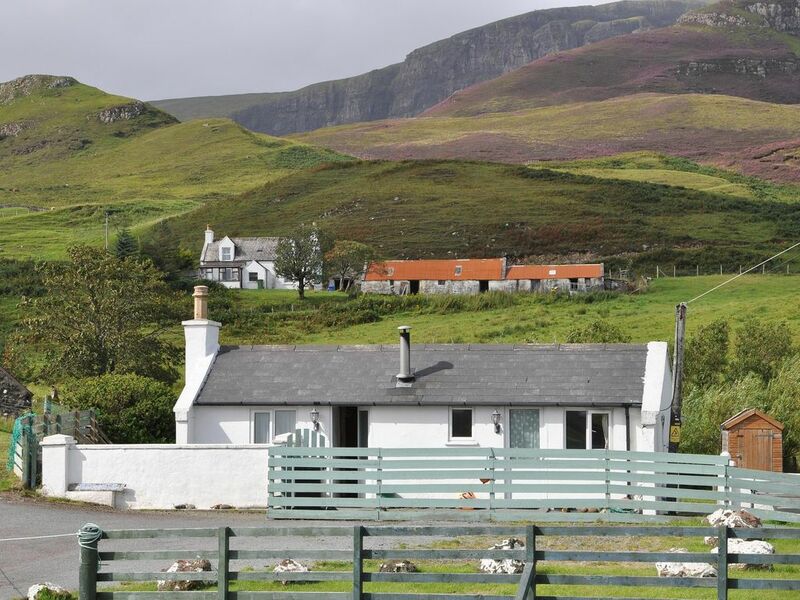 The bothy is situated in a fantastic location, just 10 minutes from the shore and close to some of the most iconic sights on Skye including the Old Man of Storr and the Quiraing. It is warm, cosy, peaceful and quiet. Bathroom with good electric shower and heated towel rail. For playing DVD's only. DVD library provided. Outside: Enclosed garden with seating and picnic table. Cleaning / Towels / Linen / Maid service: All towels and linen supplied plus a welcome tray with fresh milk, tea, coffee, hot chocolate, biscuits and oatcakes. The property is ready for guests on Saturday and is cleaned again when guests leave the following week. Warm cosy and everything as it should be. Excellent! Cosy, comfortable. Perfect for a quiet getaway . Beautiful location. We loved the area and site of Ellen’s Bothy. The little personal touches were lovely - shortbread, tea, coffee, fire lighters etc.... puts other accommodations to shame. The location is maybe just off the main road but there is literally NO traffic at night time! Enjoyed our walks down to the beach with the dogs - who weren’t just allowed - I got the impression they were welcome..... great wee extras with the biscuits and blankets for them too. Can't find fault. Excellent place to stay. Even had a long eared owl in the garden. If you love the outdoors, an excellent place to stay. We cycled, walked or kayaked everyday. Many thanks for taking the time to write a review. So glad you enjoyed the bothy! Cosy, clean, well equipped and ideally situated. Great place for rest and relaxation. Staffin Bay is a 10 minute walk from the cottage. The Quiraing and Trotternish ridge is accessible on foot also and is within a 20 minute walk. A car is recommended. The nearest airport is Inverness. Nearest train station is Kyle of Lochalsh which is an hour's drive away. Car hire is available at Inverness airport. There is a bus service from Inverness to Portree with a limited connecting service to the cottage. Driving time is 3 hours from Inverness and one hour once on the island. There is a bridge to Skye or there is a small ferry operating during the summer months from Glenelg which is highly scenic. The main town of Portree is 17 miles away and Uig (ferry terminal to the Western Isles) is 9 miles away via the Quiraing road. The spectacular Old Man of Storr is a 15 min drive back the road to Portree. The village of Dunvegan with it's castle and Coral Beach is approx one hour's drive. The Three Chimneys Restaurant is also approx one hour's drive. The local shop is 1/2 mile away and supplies all necessary items including petrol/diesel and fuel for the multi fuel stove. The nearest pub is 3km away at the Flodigarry Country House Hotel. The nearest cash point is in Uig at the Post office/shop there (9 miles). There is a hospital in Portree. Booking Notes: Please email directly to me with any booking enquiries. A deposit of 25% is required to secure the booking with the balance to be paid anytime up to 8 weeks prior to the arrival date. If a booking needs to be cancelled, I issue a full refund if it's 8 weeks before the arrival date. If not, I will refund the whole amount if I can get the cottage re-booked. Changeover Day: During winter i.e. November to end March, the changeover day is flexible. During the rest of the year, changeover day is Saturday. Guests can arrive any time after 4pm and departure time is 10.30am.